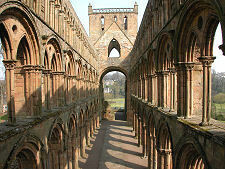 This fairly short tour takes you round Scotland's four great Border Abbeys, founded during the reign of King David I. Given the turbulent history of the Borders, which included 500 years of intermittent warfare between England and Scotland, it is amazing that anyone had sufficient resilience to built one magnificent abbey in the area, still less four. And it comes as no surprise to find that all had to be rebuilt at regular intervals after falling victim to the attentions of marauding armies. The main route shown on the map is 50 miles long, mostly on good quality roads The tour assumes a starting point of Kelso and is described in an anti-clockwise direction. Tackling the abbeys in this way means that you start with the least complete, Kelso Abbey, and finish at what we believe to be the most glorious, Melrose Abbey. The tour can be tackled from Edinburgh by the addition of 34 miles each way to Kelso. Kelso Abbey lies a couple of hundred yards south of the centre of Kelso. It became the grandest of the Border Abbeys. But being so close to the troubled border with England it saw many English armies pass by over the centuries. And the repeated attentions of the Earl of Hertford and Henry VIII's army during the "rough wooing" of the 1540s (see our Historical Timeline) with attacks in 1542, 1544 and 1545 ensured that very little of this once magnificent building survives. What you find today is part of the Abbey's west tower and traces of transepts, plus the Memorial Cloister erected to the memory of the 8th Duke of Roxburghe in 1933 which bring back to life a little of the sense of the Abbey's domestic buildings. From Kelso you head down the A698 to pick up the A68 for the last few miles into Jedburgh. Jedburgh Abbey lies on south facing slopes on the north bank of the Jed Water, close to the centre of the town. 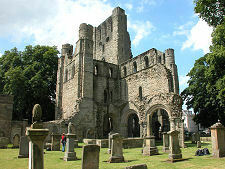 It was founded, initially as a priory, by David I. in 1138. His intention was partly to demonstrate to the English that the Scots could build on a grand scale so close to the oft disputed border between the two countries. In doing so he was tempting fate and the English: and both failed to resist the temptation many times over the following four centuries. Today the Abbey Church, though roofless, remains surprisingly complete, and dominates the southern approach of the A68 into Jedburgh. An excellent visitor centre has been built to the south of the site, and archaeological work has uncovered the bases of many of the walls of the remainder of Jedburgh Abbey. From Jedburgh you head north along the A68 to St Boswells. Here the A68 meets the A699. A short distance beyond this junction on the A68, you should turn right along the B6404, which heads north east and crosses the River Tweed a little over a mile from the village. Just beyond the River Tweed crossing, look out for a left turn onto the B6356, which takes you in a westerly direction again. Another signposted junction brings you to Dryburgh Abbey: which though a couple of miles by road from St Boswells is only a couple of hundred yards from it as the crow flies, across the River Tweed. 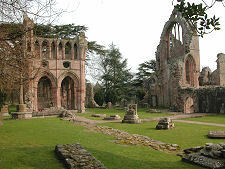 The sense of seclusion its location brings is one of the great joys of Dryburgh Abbey. You can begin to gain some sense of what a life of contemplation might have been like for the monks who lived and worshipped here. The second main attraction of Dryburgh is that so much of the domestic architecture remains visible. In a reversal of what has happened in other abbeys like Melrose and Jedburgh it is possible to gain a sense of the day to day lives of the monks, while the Abbey Church itself has largely disappeared. From Dryburgh Abbey you should retrace your steps to St Boswells, then turn north on the A68, which you follow as far as the A6091 roundabout, where you turn left and proceed into Melrose. 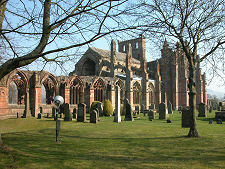 Melrose Abbey lies on the east side of the town. It was founded in 1136 when David I asked Cistercian monks from Rievaulx Abbey in North Yorkshire to found an abbey here. Today the abbey comprises the fairly complete ruins of the truly remarkable Abbey Church with, to their north, the foundations of the extensive ranges of buildings which once comprised the rest of the abbey. At the eastern end of the complex these extend through the Lay Brothers' Range as far as the millstream constructed to divert water from the River Tweed. Melrose is also home to two excellent NTS gardens, Priorwood Garden and Harmony Garden; the Trimontium Museum;	and the Commendator's House Museum. FromMelrose you should retrace your steps along the A6091 and A68 to St Boswells, then head east along the A699 to your starting point at Kelso. Though relatively short in distance, this is a tour that you could take days to complete. But tackling the four abbeys in a day gives you a sense of their similarities and differences and, most of all, a sense of the impact they must have collectively made on a relatively small area of southern Scotland in medieval times. Distances: The main circular route covers 50 miles. It can be reached from Edinburgh by the addition of 34 miles each way. Fuel: Readily available at many places on the tour.